Click here to read the full PDF version of this book. To order a copy of this book, visit Amazon.com or contact books@ngo-monitor.org. Click here to read more information about Goldstone and NGOs. Israel has been the subject of numerous controversial U.N. inquiries related to armed conflict and responses to terror attacks. But, the scope and impact of the Report of the United Nations Fact-Finding Mission on the Gaza Conflict, known as the Goldstone Report, were particularly extreme. 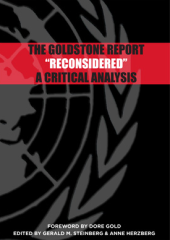 Produced under the politicized U.N. Human Rights Council, the fact-finding reflected in the Goldstone Report has been shown to be largely inaccurate. Similarly, international legal claims were distorted in a manner that maximized allegations of Israeli violations, while minimizing Hamas war crimes during the December 2008 January 2009 Gaza War. Applying a number of academic approaches, the contributors to this book systematically address the flaws of the report and examine its far-reaching consequences. As demonstrated, the Goldstone Report sets a highly flawed example for other investigations of armed conflicts and international justice. Its methodological deficiencies, double standards, misleading interpretations of law, and unsupported conclusions are antithetical to the universal principles of human rights, including the right to self-defense. The Goldstone Report Reconsidered is an essential volume for understanding the principles, as well as the distortions, of human rights and international law, particularly in the context of the Arab-Israeli conflict.